An amazing gifting phenomenon emerged during the occupation of Zuccotti Park (Liberty Square) in which strangers spontaneously organized themselves to provide food and shelter to anyone in need. This organic emergence of mass generosity flowered for two months amidst the sky scrappers of multi-national banks and the cynicism of abused souls who looked upon the ‘occupation’ as an unsanitary oddity. While it may seem odd to the mainstream personality that people would work night and day to feed, cloth, shelter and secure each other without receiving any type of financial compensation, to those who participated in the process of occupation, nothing could be more natural – or rewarding. Mainstream society is build on the assumption that “resources are scarce” and that “incentives drive decision-making”, but gifting society see things differently. Gifting societies assume essential resources such as sunlight, water, food and shelter are abundant (but possibly mis-allocated) and that personal passion drives decision-making. The assumption of abundance allows people in gifting societies to escape the crippling fear of poverty that most people in mainstream society experience on a day to day basis. When people let go of their fear of poverty, they can begin to embrace their true passions, but the transition isn’t always smooth – in fact it can be quite frightening. The occupation of Zuccotti Park frightened many people not because it was unsanitary or dangerous, but because it showed people that another world is not only possible, but practical – and may ever provide better services at lower costs. Everyday that the occupation provided shelter to hundreds, food to thousands and entertainment to millions, was a day that the mainstream world-view was not only challenged, but replaced for something more interesting and authentic. The original occupation of Wall Street is over, but the gifting society that spontaneously emerged out of it is not. Those involved in the occupation experienced, for a few short months, a society free from money, coercion and hierarchy. Occupy activists are not going back. In fact, they’re determined to recreate the experience and spread it far and wide. All of PermaBank’s code is free/libre/opensource software designed, developed and deployed by folks from the New York General Assemblies Technology Operations Group. Check out our other projects and please please please let us know if you’d like to get involved in the PermaBank project. We need your unique gifts, seriously! I had the pleasure of listening to 850+ tracks from SxSW 2011 Showcase. Nothing like a week of new music to make working on my computer an absolute pleasure. Here’s a list of my favorite bands, with the best at the top. So much great music! As if we couldn’t. As if the American people couldn’t recognize a lie when it’s told to our face. As if the American entrepreneur couldn’t maneuver around the obstacles created by international bankers and their confused economists. As if the men and women in our Armed Forces who committed to defending our Constitution couldn’t stand up to anyone who demanded that they oppress their fellow citizens. As if our farmers couldn’t team up to develop their own technologies, save their own seeds and reap their own harvests. As if honest people couldn’t win elections. “You can fool some people all the time, and all the people some of the time, but you can’t fool all the people all the time.” I think Bob Dylan said that. Americans are getting smarter – not the coastal elites who think reading the New York Times qualifies as civic participation – but the “dumb” Americans who’ve enough common sense to recognize that Big Government and Big Business have teamed up to steal our wealth while misdirecting us with the help of the corporate media. But they don’t control everything on the internet, and as the veil is lifted, both the problems and solutions become much more clear. I’m particularly interested in the solutions. While Silicon Valley gets all the press for their trendy products, thousands of programmers, engineers and developers across the world continue to build the free, libre and open source technologies upon which local economies depend. While multinational chemical companies receive prestigious awards for monopolizing agriculture, American farmers continue to share best practices, organizing seed banks and reach customers directly through farmer’s markets. While central bankers act like economic gods with their reactionary monetary policies, local entrepreneurs continue to discover new opportunities to create real value for their communities. If you’re looking for problems, you’re going to find prestigious people in glossy magazines whining about the difficulties that lie ahead. If you’re looking for solutions, you’re going to find unrecognized folks working quietly and feverishly, as if the fate of the world depended on it. The time for criticism is over. The time for action is here. If you’re interested in the emergence of the new, participatory, local-networked economy, what Buckminster Fuller would describe as “a new model that makes the existing models obsolete,” start reading about free/libre/open source technology and ask yourself this simple question: what if everyone had the tools they need to create what they want. 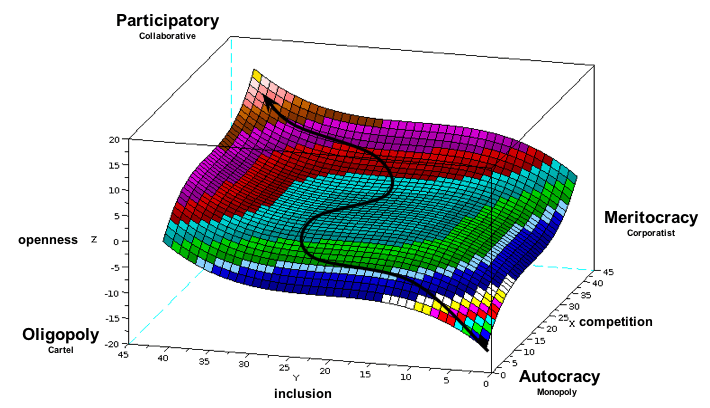 Dahl proposes that all political systems can be places on a graph with two axis: competitiveness and inclusiveness. Competitiveness asks: who can compete for political office. Inclusiveness asks: who can decide who wins the competition. We can apply the concept of polyarchy by asking these questions of different political systems: for example: the America and Israel. America has a two-party system which makes it less competitive than Israel, which has dozens of political parties in parliament, enabling more people with more diverse perspectives to compete. This makes Israel a more “competitive” state than American. But, since Israel doesn’t allow Palestinians to vote, America is a more inclusive state. Dahl’s definition of polyarchy is good, but it’s not complete. His theory doesn’t account for the most powerful force in politics: information distribution. Those who control access to information have tremendous political power because they can amplify certain elements within society and silence others. Including “openness” (defined as transparency and accessibility) into the model improved it because it allows us to address the issue of information distribution. In a state with positive openness, information flows between government and society in an efficient manner that facilitates public participation in political processes. In a state with negative transparency, misinformation flows between government and society, enabling a secretive ruling class to exploit the general public. By adding openness to Dalh’s polyarchy graph as the third dimension, one naturally wonders what the relationship between competitiveness and inclusiveness could be. Can we graph this relationship? After looking at dozens of possibilities, z=x^3 + y^3 looks compelling. In this graph, a positively transparent society appears in the top left area of the plane while a negatively transparent society appears in the bottom right area one. A society that is inclusive but not competitive has a negative openness. This makes sense because, in this scenario, a lot of people are supporting a poor selection of leaders, making the construction of false realities essential to convince people the situation is acceptable. Ex. the Soviet Union had a vast propaganda machine while the one-party political made competition virtually nonexistent. A society that is competitive but not inclusive is highly transparent. This makes sense because each individual who can vote has an unusually high influence on their political system, so it makes sense for them to invest time and resources in information that makes selecting good leadership easier. Ex. 19th century America had a very active, highly decentralized news and information distribution sector (newspapers) geared towards properties white men of voting age. We’re in the early stages of “participatory” politics as new tools (ex. OpenCongress) are enabling the public to increase transparency and accessibility of information to levels impossible before the advent of networked technologies. A tremendous increase in government transparency seems to be imminent. We could watch this happen in real time if we turned our 3D graph into a 4D animation, allowing us to track different societies paths towards more participatory political processes over time. We need a common, quantitative understanding of political imperative so our governments can create purposeful foreign policies that encourage competitiveness, inclusiveness and openness. A simple way for national governments to advance a foreign policy based on quantitative principle would be to raise tariffs with closed nations and lower tariffs with closed ones. If there is one thing I learned growing up the child of ‘branding professionals’ it’s that words can’t be trusted because clever people are willing to twist their meaning to meet their client’s demands. I believe this simple fact is responsible for much confusion throughout human history. There is a defense against the manipulation of meaning and it’s simply to stop trusting words and start trusting people. This is a defense the Eastern masters have been practicing for thousands of years. Before discounting this approach to life as impractical, ask yourself this question: how can people lie without using words? All people can do is act. Your only task is interpreting that action. This becomes easier as you develop preferences. Honest – Openness – Transparency: Are you willing to teach me what you do best? Dignity – Integrity – Localism: Are you acting voluntarily and with authenticity? Passion – Energy – Love: Do you feel like you’re exactly where you’re meant to be? A person or brand can use whatever lovely language they like, but if their actions aren’t embodying these qualities, they’re wasting my time and their own. Life is too short to be afraid of yourself.